SpaceX and NASA engineers are investigating the cause of an engine failure on the Falcon 9's last flight Oct. 7. One of the first stage's nine kerosene-fueled Merlin 1C engines shut down after a sudden loss of pressure about 79 seconds after liftoff from Cape Canaveral, Fla. The rocket continued into orbit and successfully deployed SpaceX's Dragon cargo freighter on a trek to the International Space Station. SpaceX has a $1.6 billion contract with NASA for cargo resupply services to the station. 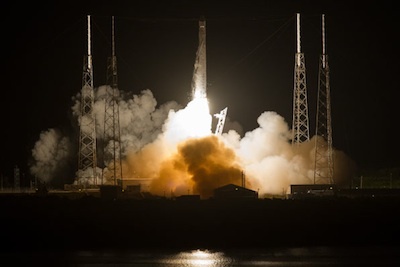 Because of safety guidelines imposed by NASA to prevent a potential collision with the space station, the Falcon 9 rocket put an Orbcomm data communications satellite in a lower-than-planned orbit. The Orbcomm spacecraft was left in an unstable orbit and re-entered the atmosphere three days after launch. Pending the conclusion of the engine anomaly investigation, SpaceX and NASA plan to launch the next Falcon 9 rocket in March on another space station logistics mission. That mission will be the final launch of a Falcon 9 rocket in its current configuration. Three commercial launches are next on SpaceX's manifest. The customers - the Canadian Space Agency, SES of Luxembourg and Orbcomm Inc. of New Jersey - all plan separate launches on three Falcon 9 rockets before the middle of 2013. Each flight will employ a new version of the Falcon 9 launcher with more powerful Merlin 1D engines, stretched fuel tanks, a payload fairing, and a new first stage engine configuration. The schedule is tight as SpaceX activates a new launch pad in California and modifies its facility at Cape Canaveral to accommodate the larger next-generation Falcon 9. The upgraded Falcon 9 - called the Falcon 9 v1.1 - is undergoing qualification testing before the first flight vehicle ships to SpaceX's new launch site at Vandenberg Air Force Base, Calif.
SpaceX is wrapping up construction of a launch facility at Space Launch Complex 4-East at Vandenberg, the former home of Titan 4 rockets on the U.S. West Coast. 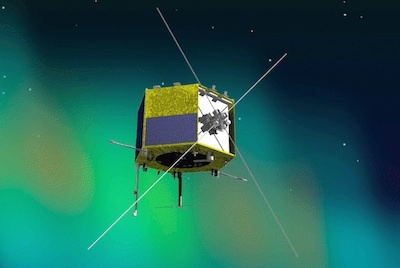 Artist's concept of the Cassiope satellite. Credit: MDA Corp. The first launch of the Falcon 9 v1.1 is expected in the first half of 2013 with the Canadian Space Agency's Cassiope satellite, a hybrid craft designed to monitor space weather and demonstrate a space-based digital courier communications system. The launch of Cassiope is expected in April or May, according to Melanie Beauchesne, a Canadian Space Agency spokeswoman. The 1,100-pound Cassiope satellite will fly in an elliptical orbit between 200 miles and 900 miles above Earth. Orbcomm is next on SpaceX's launch manifest with a dedicated Falcon 9 launch from Florida. Eight Orbcomm satellites will launch on a Falcon 9 v1.1, bolstering the company's satellite fleet to facilitate two-way data communications services for customers in the heavy equipment, transportation, maritime, agriculture, oil and gas, energy, and government sectors. The Orbcomm payload aboard the Falcon 9 rocket's October launch was a prototype for Orbcomm's second-generation, or OG2, system in low Earth orbit. "Had our prototype been the primary payload for this past launch, we believe we would have been successful," said Marc Eisenburg, Orbcomm CEO, in a Nov. 8 earnings call with financial analysts. "We intend to launch the remainder of the OG2 satellites with SpaceX." Another Falcon 9 rocket, also due to launch in mid-2013 from Florida, will orbit the SES 8 satellite to provide television broadcasting, government communications, and other services over South Asia. SpaceX's contract with SES - signed in 2011 - stipulates it must complete at least one flight of the upgraded Falcon 9 before the SES 8 launch. Yves Feltes, an SES spokesman, told Spaceflight Now the SES 8 launch is scheduled before the middle of 2013. The international operator has arranged a backup launch opportunity with Arianespace for an Ariane 5 launch. 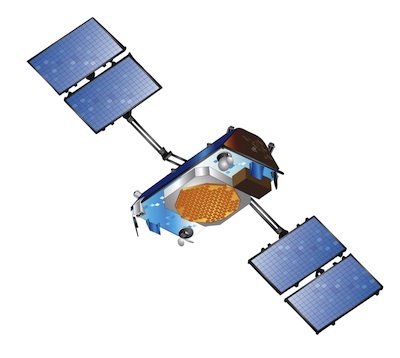 Artist's concept of the SES 8 satellite. Credit: Orbital Sciences Corp. 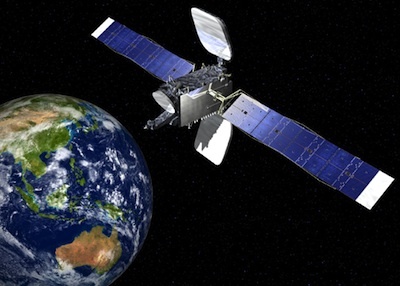 The SES 8 launch is scheduled to be SpaceX's first commercial launch into geostationary transfer orbit, or GTO, the drop-off point for satellites heading for orbit 22,300 miles over the equator. Satellites in geostationary orbit hover over a fixed point on Earth and appear at the same point in the sky for antennas on the ground. So far, SpaceX has not launched a rocket to geostationary transfer orbit. Four Falcon 9 flights to date have targeted low Earth orbit on three demonstration missions and for SpaceX's commercial cargo service to the space station. The Falcon 9 v1.1 will have a capacity to lift up to 10,700 pounds into geostationary transfer orbit. Iridium Communications Inc., SpaceX's second-largest launch customer after NASA, will begin sending its Iridium Next constellation of mobile communications satellites to orbit in early 2015. Matthew Desch, Iridium's CEO, said 70 Iridium Next satellites are booked for launch on seven Falcon 9 missions. The Iridium flights will originate from the Falcon 9 rocket's California launch complex. Iridium plans to exercise a contract option with Kosmotras, a Moscow-based launch provider, to place two Iridium Next satellites on a Dnepr rocket as a pathfinder before deploying the rest of the 72-satellite fleet with SpaceX. The Dnepr rocket is composed of decommissioned Soviet ballistic missile parts. Desch said the Falcon 9's ability to still accomplish its primary mission after the Oct. 7 engine failure was a "big confidence builder" and it "shows they have built an adaptable and flexible rocket." "They got the job done, even when there are glitches," Desch said Nov. 1. "We continue to have full confidence in the Falcon 9 system, and expect it to remain [successful] in the 20 or so launches on their manifest before Iridium Next, which will also be successful." SpaceX has also signed Falcon 9 launch contracts with Thaicom, an operator affiliated with the government of Thailand, AsiaSat of Hong Kong, Asia Broadcast Satellite and Mexsat.